Zeaxanthin is a carotenoid found in the retina of the human eye. As you might assume, its health benefits are directly related to the eyes and may help significantly with the prevention of macular degeneration. Its main function, however, is to filter out near-to-UV sunlight to help protect your eyes from potentially damaging sunrays. As a group, carotenoids are phytonutrients that protect plants from damage caused by UV radiation and other environmental factors. In humans, they have also been shown to inhibit the proliferation of various types of cancer cells such as those affecting the lungs, stomach, cervix, breast, bladder, skin, and mouth. They have been proven to protect against atherosclerosis, cataracts, macular degeneration (as we just mentioned) and other major degenerative disorders. Five of the major carotenoids are: beta carotene, alpha carotene, lycopene, lutein, and zeaxanthin. The body does not naturally produce zeaxanthin, making vegetables and fruits with this carotenoid a fundamental staple in any balanced diet. Some high zeaxanthin foods include peaches, celery, zucchini, mango, orange pepper, kiwi, lettuce, kale, broccoli, grapes, green beans, squash, sweet potatoes, and carrots. Egg yolks, spinach, and corn also have high concentrations of zeaxanthin. As mentioned previously, zeaxanthin is thought to play a major role in the prevention of macular degeneration. This condition can cause blurred vision and possible blindness as a person ages. In a Scandinavian medical report published in the Scandinavian medical journal "Acta Opthalmological Scandinavica," studies found that patients with a low intake of zeaxanthin were twice as likely to suffer macular degeneration than those who ate a diet high in zeaxanthin. 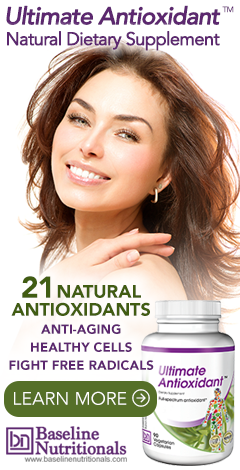 Zeaxanthin's antioxidant effect is significantly enhanced by the presence of lutein and bilberry. When combined with vitamin C, these three antioxidants have been shown to significantly decrease the risk of cataracts. One reason for this is that zeaxanthin, like it does in plants, helps protect both the retina and lens from oxidative damage caused by ultraviolet rays and blue-green light. It basically works as a natural sunscreen for the eyes. To top it all off, negative zeaxanthin side effects are practically nil. If preserving your eyesight wasn't enough of a benefit for this carotenoid, there is also evidence, as we mentioned earlier, that it may actually inhibit the growth of certain types of cancer as well. In addition, it also may offer protection to the skin against age-related issues such as hydration, elasticity, and lipid oxidation (leads to skin aging). These are a few of the reasons you’ll find zeaxanthin in two of Jon Barron’s most popular supplements: Ultimate Antioxidant and Private Reserve Superfood. The best part about zeaxanthin is if you're eating the recommended allowances of fruits and vegetables daily (2 cups of fruit and 2 1/2 cups of vegetables), you're probably already consuming a good portion of this carotenoid. This is especially true if your diet consists of the consumption of dark green and starchy vegetables such as corn and squash several times a week. Hey there! I simply would like to give you a big thumbs up for your great information. I'll be returning to your website for more soon.